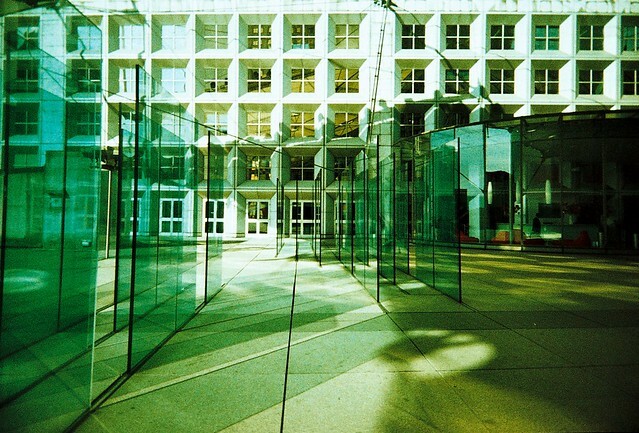 The last time I blogged about Paris I gushed about the Lomography X-pro Chrome film because when I love something... I really love it. But when I don't... I really don't. And I do not like this Lomography X-pro film (not to be confused with the X-pro Chrome). In fact I'm incredibly frustrated as I really do love the composition, angle and content of these photos, yet the choice of film has really spoilt them for me. It's taken me this long to upload them onto Flickr and on here just because of the disappointment. What do you think? I love the cross processed distortion with the sunset photos because the colours were rich and gorgeous, and as with the chrome, the blues and turquoises are lovely, yet the overall green/yellow tone in these seems sickly and insipid in comparison to me. I really want to like them... but I just can't seem too. On another note, these photos were taken at the Le Grande Arch de la Defence, which is outside the main city of Paris in the business district and it was a massive culture shock for us after spending the week in the city. It felt like we had travelled to the future haha.